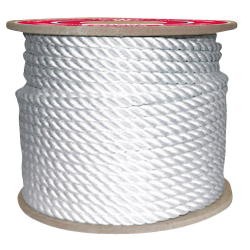 White 3-strand nylon rope. Effective, all-purpose shock absorbent rope. 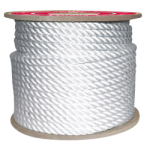 Firm Lay construction keeps rope round in applications with the control that can only be found in this traditional-style lead. High strength and elasticity. Resistant to abrasion, sunlight, rot, mildew and many common chemicals.